You’re a young salamander among giants, and it’s mating season. There’s no way you can compete with the heavyweights, so what do you do? You start a sperm-based flash mob. 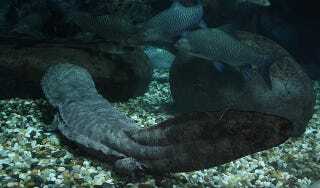 Giant salamanders can get to be several feet long, but it takes them years to do it. For females, this isn’t a problem. As soon as they mature, they can start mating—or at least they can do what passes for mating. Female salamanders reproduce by laying eggs which the male fertilizes. Male salamanders don’t have the same option. These salamanders mate in burrows on the banks of rivers, and males fight for control of the biggest, nicest burrows. As the males gain weight and experience, they can control multiple burrows at the same time. Smaller males are left out in the cold. Once mating season is over, they have to wait an entire year, during which they could die at any time, for another chance. They rarely have any success when fighting a big male, so they use another strategy. They get into a group and watch a female go into a larger male’s burrow. If she likes the place, she’ll start laying eggs. Usually she will be watched by the large male, but while he has strength, the small males have numbers. The smaller males estimate when the female will be part way through laying her eggs, and then storm the burrow. As soon as they spot her, they scramble around, keeping out of the way of the large male and releasing clouds of sperm. When they’re done, they rush back out of the burrow, hoping that at least some of their sperm makes it to an egg or two.